With all of the below productions, we want to express our heartfelt gratitude to the Synergic Theater’s many talented and dedicated performers and collaborators. Hopefully, some small sense of their enormous contributions can be gleaned from programs linked here. Winter 1974: Project Synergy is formed — Duke University, Durham, NC. Spring 1974: first Synergic workshop — the Ark, East Campus, Duke University, Durham, NC. July 4-5, 1974, Synergic Theater premiere performances: “Syncronisms,” “Cartoonik,” “Delta Carnival” — Page Auditorium, West Campus, Duke University, Durham, NC. Sponsored by The USSR/US International Track and Field Committee and Summer Arts Festival. July 1975: Synergic Theater Creative Process Workshop — the Ark, East Campus, Duke University, Durham, NC. May/June 1976: Synergic Theater Creative Process Workshop — the Ark, Duke University, Durham, NC. Presented with Loblolly Summer Performing Arts Workshop. September 10, 1976: incorporated in North Carolina as the Synergic Foundation for the Arts. 1976/77: New course in Synergic Arts offered at Duke. February 11, 12 & 18, 19, 1977, Synergy — Cube Roots: “Pipe Dreams,” “One God, Two Me, Three You and Four Dimensions,” “The Death of Charlie Noble” — Baldwin Auditorium, East Campus, Duke University, Durham, NC. June 30 and July 1, 1977, workshop showing: Bits and Pieces of a Midsummer Night’s Theme — the Ark, East Campus, Duke University, Durham, NC. Fall, 1978: Synergic Theater moves to San Francisco, CA with Co-Directors David & Suzanne White Manning. April 1979: company moves into its own studio on Haight Street. Studio space operates as Synergic Theater and company as Delta Carnival. June 1979: Synergic Theater Creative Process Workshop — Synergic Theater, San Francisco, CA. July 13-14, 1979: “Lullaby” (Suzanne White Manning) — presented with the San Francisco Bay Area Dance Coalition (juried), Margaret Jenkins Performance Space, San Francisco, CA. October-November 1979 previews: “The Fool,” “Birthday,” “Private Lives” — Synergic Theater, San Francisco, CA. December 24, 1979: Synergic Foundation for the Arts incorporated in the State of California. March 21-23, 1980 premieres: “The Fool,” “Birthday,” “Private Lives” — Synergic Theater, San Francisco, CA. June 5-21, 1980, premiere: “Ruins”, an evening-length shadow screen work — Synergic Theater, San Francisco, CA. July 1980: Synergic Theater Creative Process Workshop — Synergic Theater, San Francisco, CA. November 7-December 13, 1980: “Ruins” — Synergic Theater, San Francisco, CA. December 3-5, 1981: “Ruins” — Southern Exposure Gallery/Project Artaud, San Francisco, CA. March 26-28, 1982: “The Fool,” “Private Lives,” “Discarnate Landscape,” — Margaret Jenkins Performance Space, San Francisco, CA. September 15-October 8, 1982: Synergic Theater Creative Process Workshop and showing — the Ark, Duke East Campus, Durham, NC in association with Duke University Office of Continuing Education. January 7-9, 1983: “The Fool,” “Private Lives,” “Discarnate Landscape” (and works from guest, Richard Haisma) — Reynolds Theater, Duke West Campus, Durham, NC, in association with the Duke Dance Program. May 7, 1983: “Private Lives” — presented with the 5th Annual NC Dance Showcase, Stewart Theater, North Carolina State University, Raleigh, NC. May 19-21 1983: “Private Lives,” “Birthday” (expanded version) — Page Auditorium, Duke West Campus, Durham, NC in association with the Duke Dance Program and Artsfare ’83. July 20-23, 1983: “Private Lives,” “Birthday” — Marymount Manhattan (College) Theater, New York City. Company’s New York City premiere. March 11, 1984, memorial tribute performance for Frank Smullen and Giorgio Ciompi: “Pipe Dreams,” “Lullaby” (from “Private Lives”) and “Birthday” — Reynolds Auditorium, Duke West Campus, Durham, NC, in association with the Duke Dance Program, Duke Institute of the Arts, Duke Technical Services. May 31-June 2 & June 7-9, 1984, premiere: “Lost,” an evening-length shadow screen work — the Ark, Duke East Campus, Durham, NC, presented with the 400th Anniversary British-American Festival. June 21-23 & 28-30, 1984: “Lost” — Schimmel Center for the Arts, Pace University, New York City. September 13, 1984: Synergic Theater Creative Process Workshop — presented with the Department of Dance, UNC-Greensboro, NC. July 28-August 22, 1986: Synergic Theater Creative Process Workshop — presented with Pace University Department of Speech and Drama, Schaeberle Studio Theater, Pace University, New York City. 1987: the Synergic Theater begins an in-residence association with Pace University in Lower Manhattan, NYC. June 23-July 24, 1987: Synergic Theater Creative Process Workshop — Schaeberle Studio Theater, Pace University, New York City. June 2-4, 1988: “Old Stones” (expanded version), “The Fool” (revised for solo performer), and guest artist, Richard Haisma — Schaeberle Studio Theater, Pace University, New York City. June-July 1988: Synergic Theater Creative Process Workshop, Parts 1 & 2 — Schaeberle Studio Theater, New York City. August 1988: setting revised version of “Lost” in residence at Schimmel Center for the Arts, Pace University, New York City. September 8-10 and 15-17, 1988: “Old Stones,” “Lost” — Schimmel Center for the Arts, Pace University, New York City. January 4-14, 1989: Synergic Theater Creative Process Workshop — Schaeberle Studio Theater, Pace University, New York City. September 6-9, 1989: “I, Migrant” (premiere), “The Fool,” “Private Lives” — Pace Downtown Theater (aka Schimmel Center for the Arts), Pace University, New York City (“I, Migrant” set in August residency). September 21-October 11, 1989, co-directors, David and Suzanne White Manning in-residence — Duke University, Institute of the Arts, Durham, NC. January 2-5, 1990: New Year Synergic Theater Creative Process Workshop — Schaeberle Studio Theater, Pace University, New York City. June 8-10, 1990: “The Fool,” “Private Lives,” “I, Migrant” — presented with Pace Downtown Theater’s (aka Schimmel Center for the Arts) Downtown Festival of Performing Arts, New York City. October 1990: one-day Synergic Theater Creative Process Workshop — presented with Department of Dance and Theater, SUNY-Stony Brook, NY. Synergic Theater company residencies to complete three-part shadowscreen work Terra Incognita, an officially designated project of the American and Spanish governments’ Columbus Quincentenary commissions. 1) June 30-July 21, 1991: residency for the development and preview showing of the final section of Terra Incognita, “Pasos” — Tompkins Center, Cedar Crest College, Allentown, PA. 2) October 1991: two-week residency with the Pace Downtown Theater (aka Schimmel Center for the Arts) for combining the entire three-part work into an evening-long production. 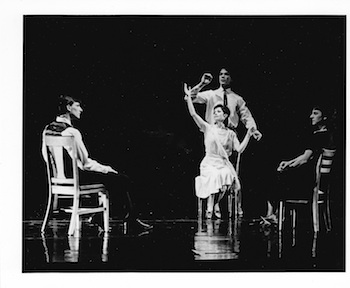 October 11-14, 1991, premiere: Terra Incognita (see above), incorporating “Pasos,” “Lost,” “I, Migrant — Pace Downtown Theater (aka Schimmel Center for the Arts), Pace University, New York City. February 13-20, 1993: Synergic Theater In-Residence for Dance Awareness Week, presenting workshops and continuing development of “Editing Eurydice,” culminating in preview performance — Hartwell Dance Theater, Suny College@Brockport, Department of Dance, Brockport, NY. May 19-21, 1993: “Editing Eurydice” (premiere) presented with TWEED New Works Festival — Ohio Theater, Soho, New York City. August 15-26, 1994: Synergic Theater 20th Anniversary Creative Process Workshop and showing (notes) — Church of the Holy Trinity theater space, Upper Eastside, Manhattan, New York City. Summer 2013: Synergic Theater begins residency in cyberspace.